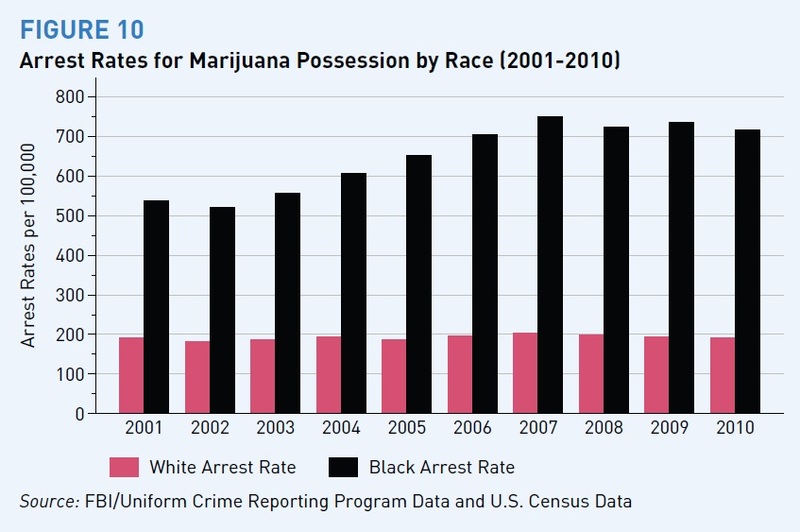 This report is the first to examine marijuana possession arrest rates by race for all 50 states (and the District of Columbia) and their respective counties from 2001 to 2010. 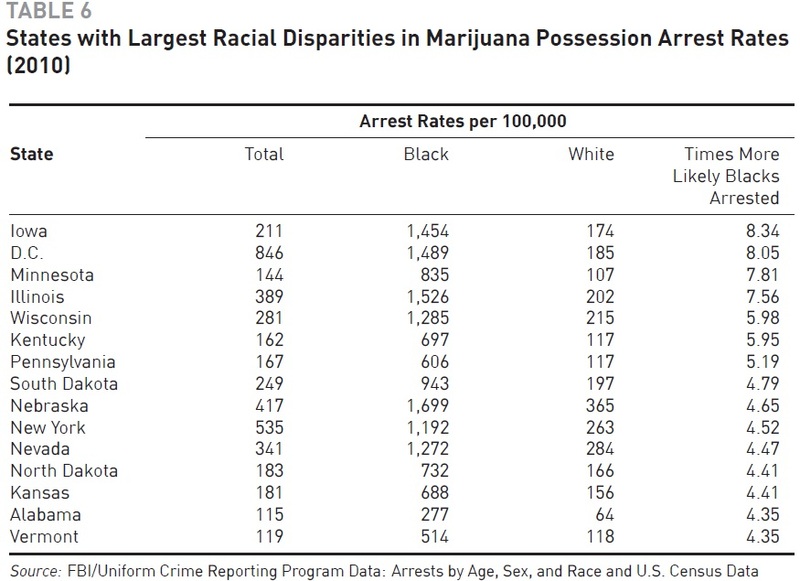 The report relies on the Federal Bureau of Investigation’s Uniform Crime Reporting Program and the United States Census’ annual county population estimates to document arrest rates by race per 100,000 for marijuana possession. 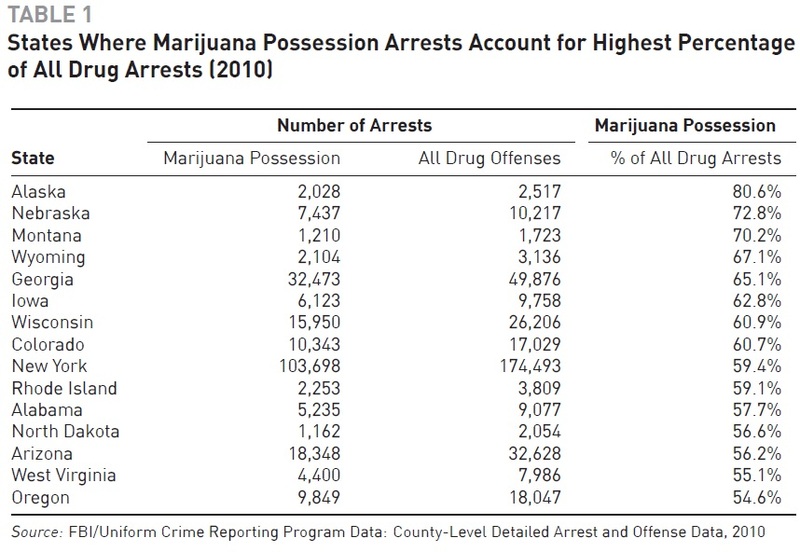 The report finds that between 2001 and 2010, there were over 8 million marijuana arrests in the United States, 88% of which were for possession. 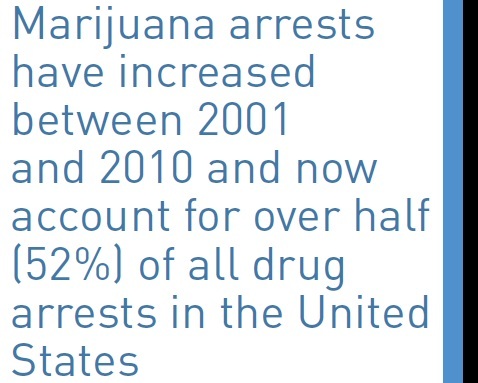 Marijuana arrests have increased between 2001 and 2010 and now account for over half (52%) of all drug arrests in the United States, and marijuana possession arrests account for nearly half (46%) of all drug arrests. 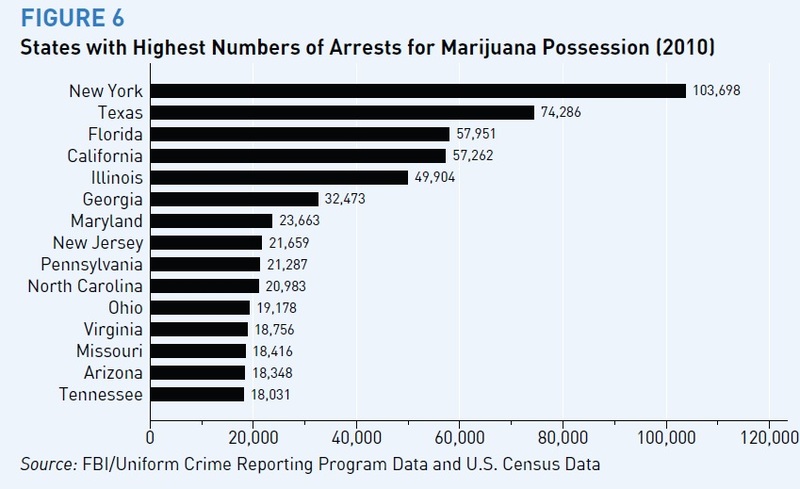 In 2010, there was one marijuana arrest every 37 seconds, and states spent combined over $3.6 billion enforcing marijuana possession laws. 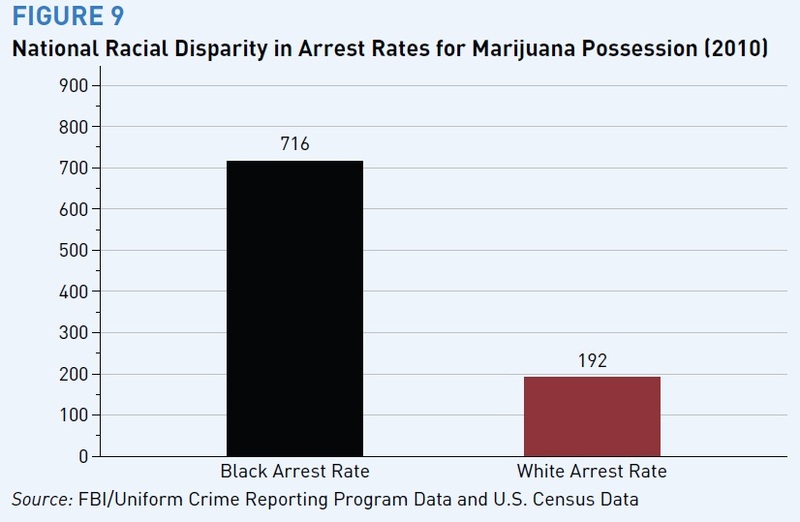 The report also finds that, on average, a Black person is 3.73 times more likely to be arrested for marijuana possession than a white person, even though Blacks and whites use marijuana at similar rates. The report concludes that the War on Marijuana, like the larger War on Drugs of which it is a part, is a failure. It has needlessly ensnared hundreds of thousands of people in the criminal justice system, had a staggeringly disproportionate impact on African-Americans, and comes at a tremendous human and financial cost. The price paid by those arrested and convicted of marijuana possession can be significant and linger for years, if not a lifetime. 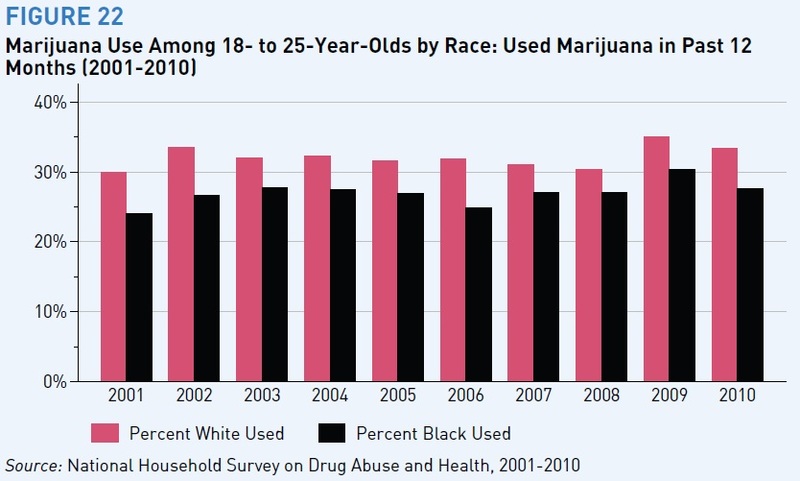 Arrests and convictions for possessing marijuana can negatively impact public housing and student financial aid eligibility, employment opportunities, child custody determinations, and immigration status. To repair this country’s wrecked War on Marijuana, the ACLU recommends that marijuana be legalized for persons 21 or older through a system of taxation, licensing, and regulation. 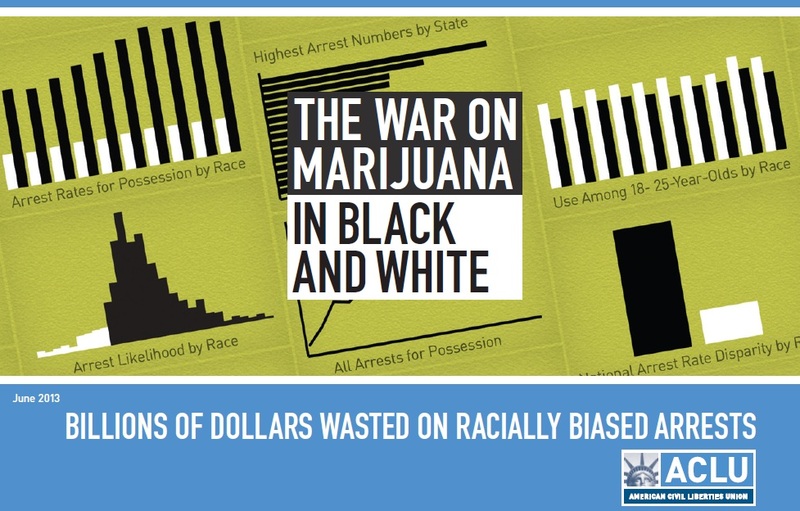 Legalization is the smartest and surest way to end targeted enforcement of marijuana laws in communities of color, and, moreover, would eliminate the costs of such enforcement while generating revenue for cash-strapped states. States could then reinvest the money saved and generated into public schools and public health programs, including substance abuse treatment. 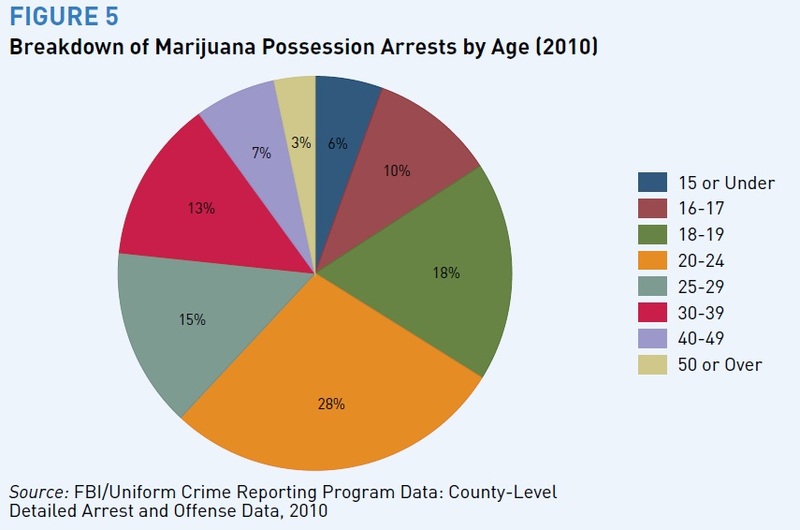 If legalization is not possible, the ACLU recommends depenalizing marijuana use and possession for persons 21 or older by removing all attendant civil and criminal penalties, or, if depenalization is unobtainable, decriminalizing marijuana use and possession for adults and youth by classifying such activities as civil, not criminal, offenses. The ACLU also recommends that until legalization or depenalization is achieved, law enforcement agencies and district attorney offices should deprioritize enforcement of marijuana possession laws. 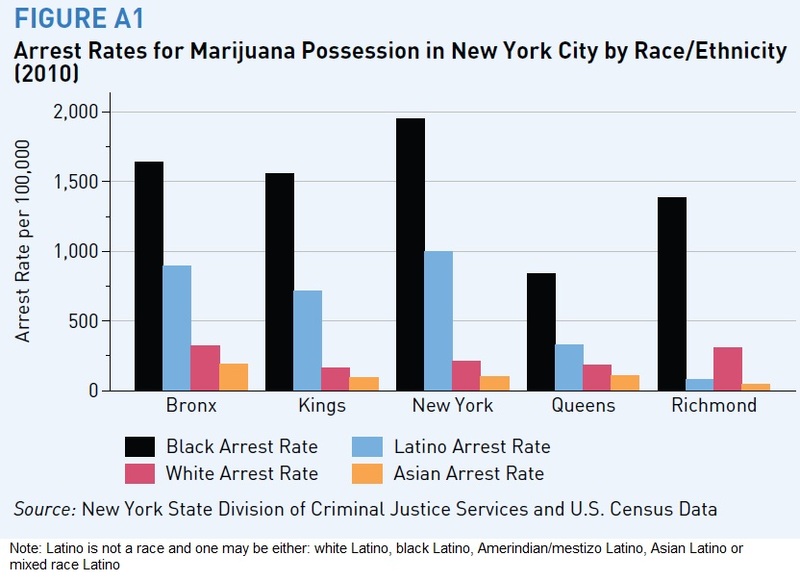 In addition, police should end racial profiling and unconstitutional stop, frisk, and search practices, and no longer measure success and productivity by the number of arrests they make. Further, states and the federal government should eliminate the financial incentives and rewards that enable and encourage law enforcement to make large numbers of arrests, including for low-level offenses such as marijuana possession. 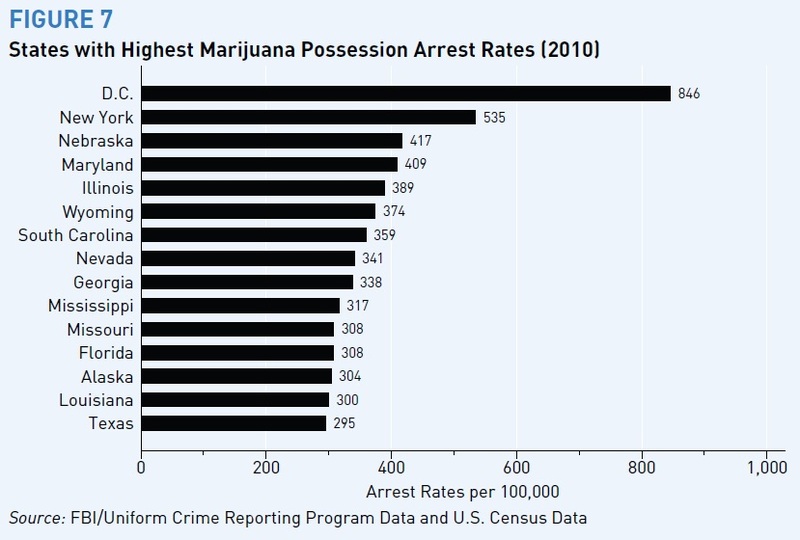 In sum, it is time to end marijuana possession arrests. 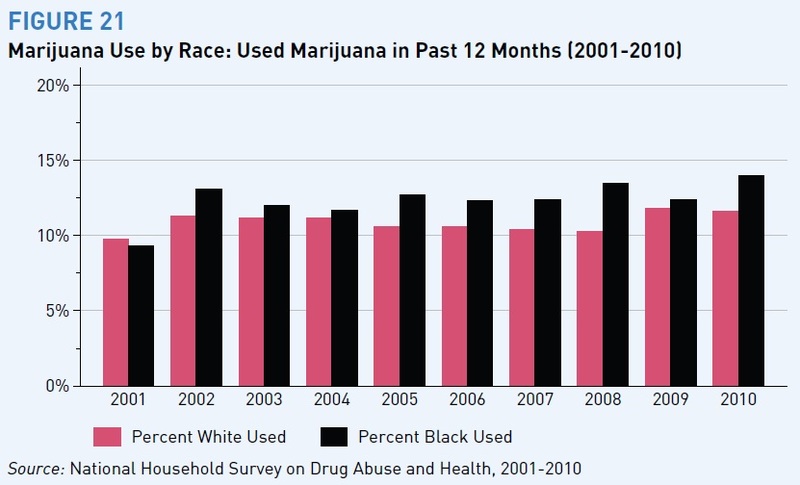 The report also finds that, on average, a Black person is 3.73 times more likely to be arrested for marijuana possession than a white person, even though Blacks and whites use marijuana at similar rates. 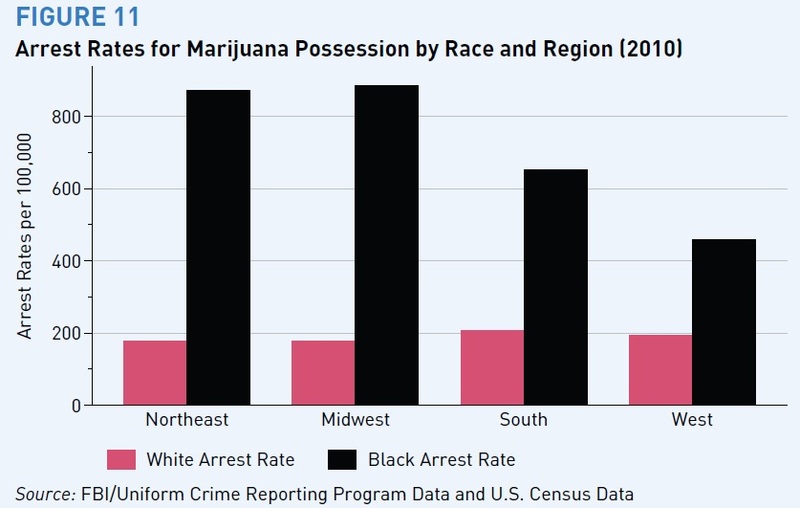 Such racial disparities in marijuana possession arrests exist in all regions of the country, in counties large and small, urban and rural, wealthy and poor, and with large and small Black populations. 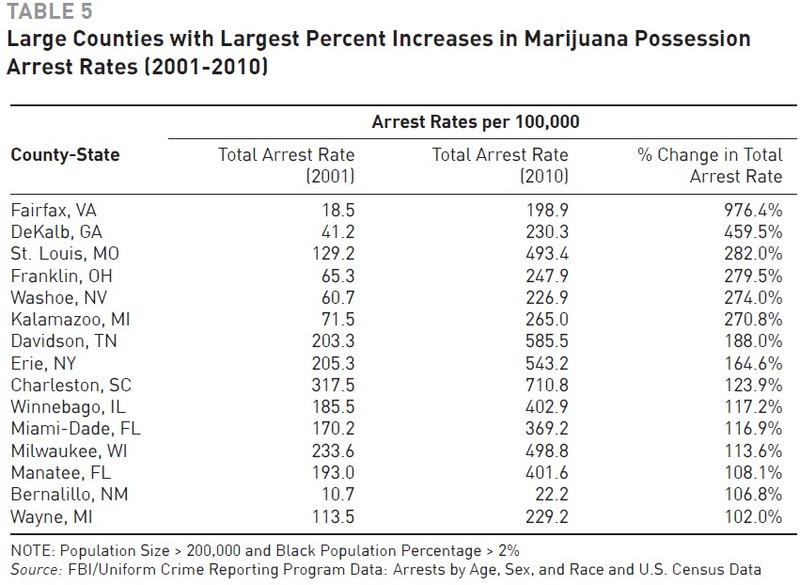 Indeed, in over 96% of counties with more than 30,000 people in which at least 2% of the residents are Black, Blacks are arrested at higher rates than whites for marijuana possession. 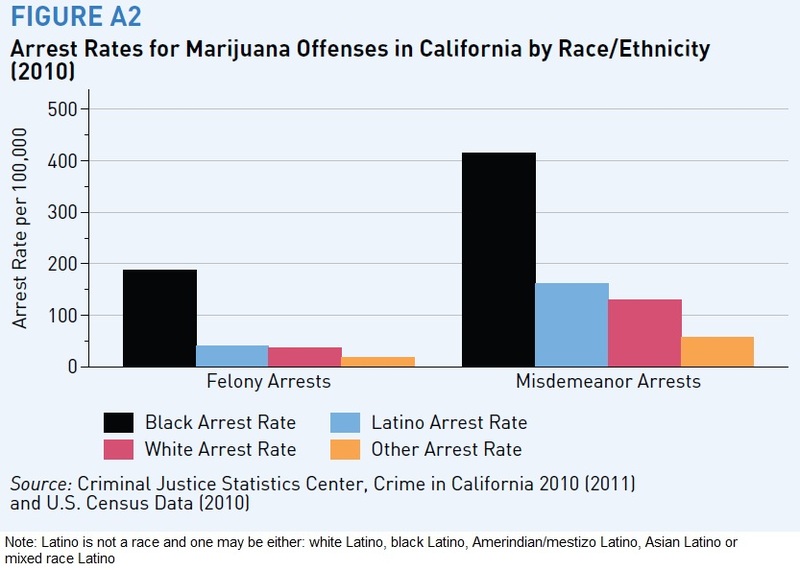 Racial disparities in marijuana possession arrests exist regardless of county household income levels, and are greater in middle income and more affluent counties. In the counties with the 15 highest median household incomes (between $85K–$115K), Blacks are two to eight times more likely to be arrested for marijuana possession than whites. In the 15 counties in the middle of the household income range (between $45K–$46K), Blacks are over three times more likely to be arrested for marijuana possession than whites. In the poorest 15 counties (median household incomes between $22K–$30K), Blacks are generally 1.5 to five times more likely to be arrested. 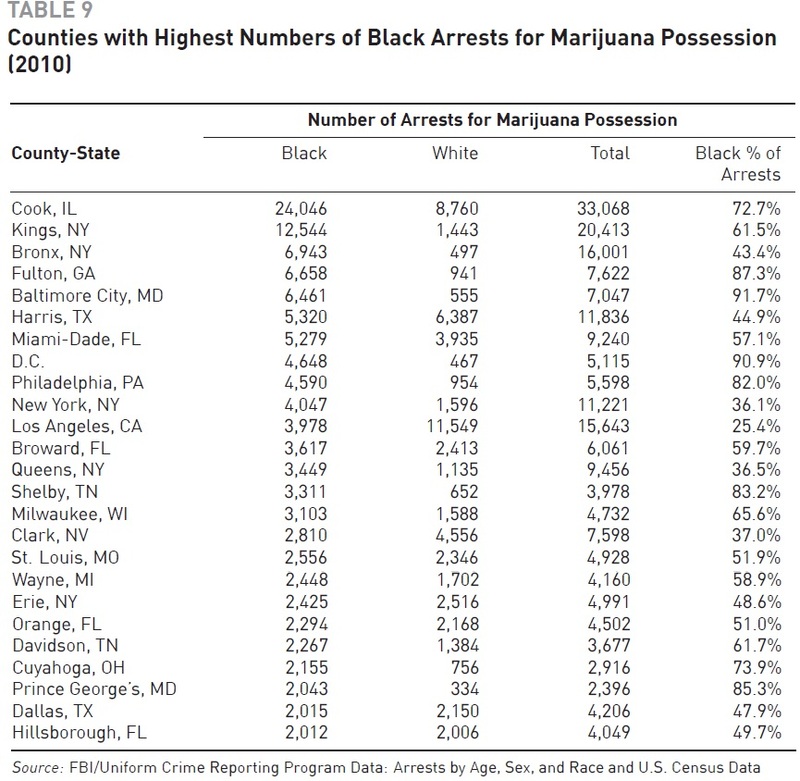 This report examined 945 counties in the United States with at least 30,000 residents and where Blacks make up at least 2% of the population; these 945 counties represent 78% of the total United States population.26 Of these counties, in only 37 (or 3.9%) is the white arrest rate for marijuana possession higher than the Black arrest rate. 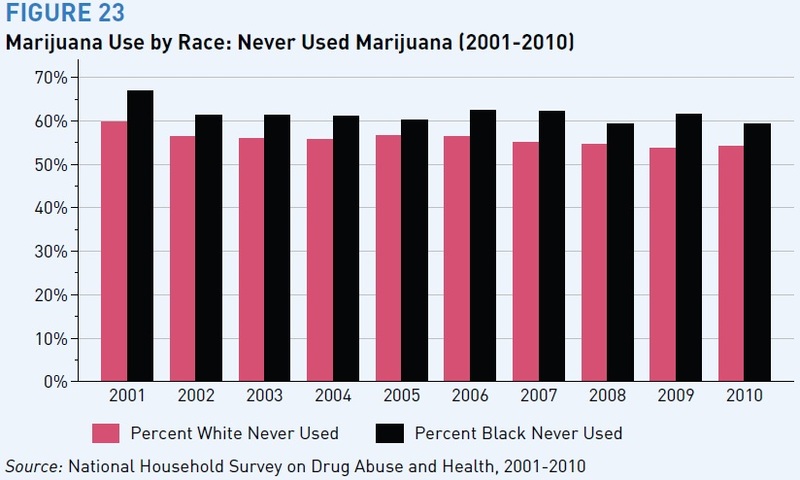 In other words, in over 96% of the counties examined in this report, Blacks are more likely than whites to be arrested for marijuana possession. 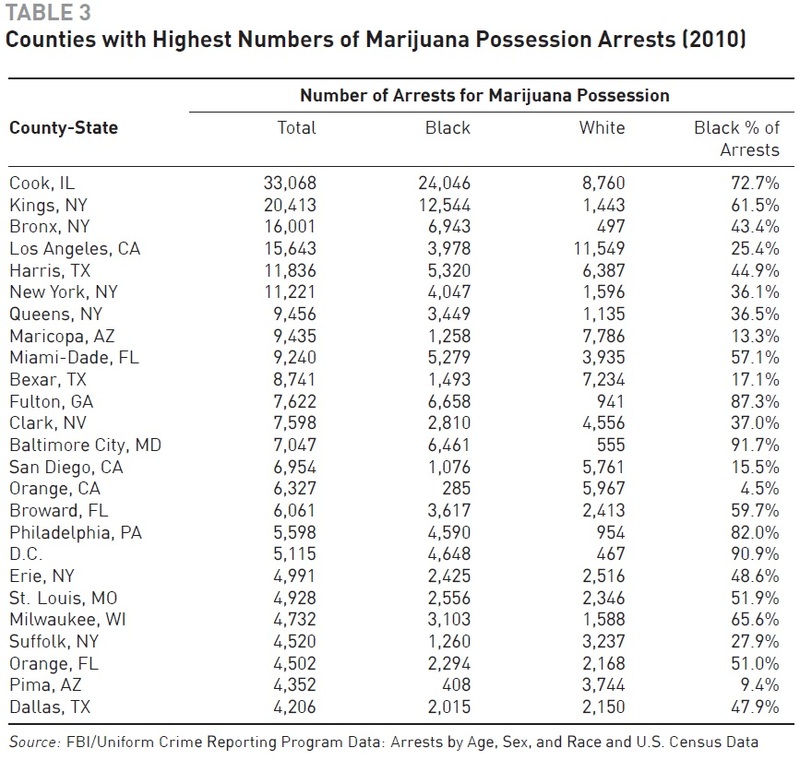 The counties with the highest Black arrest rates for marijuana possession are spread throughout the country, from Campbell and Kenton, KY, to Worcester, MD; from Dare, NC, to Livingston and Montgomery, IL; from Onondaga, Broome, and Chautauqua, NY, t Chambers, Kleberg, Hopkins, Cooke, and Van Zandt, TX. 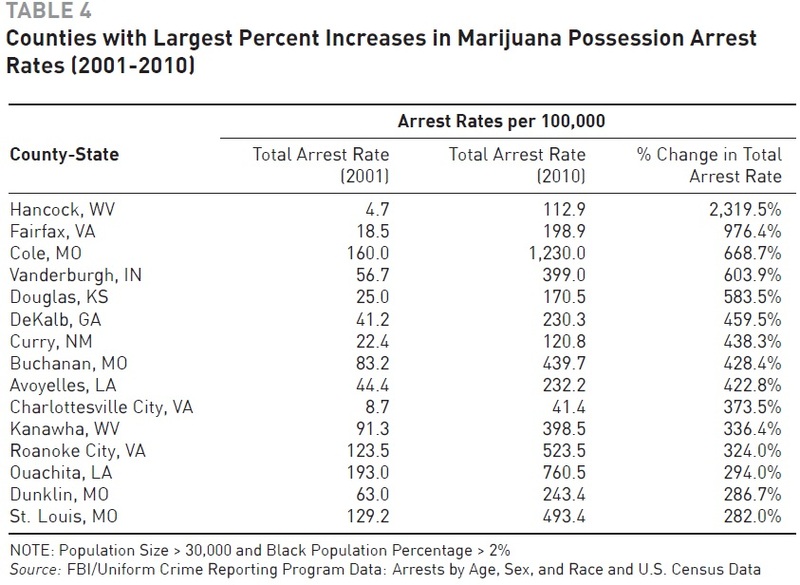 92% of marijuana possession arrests in Baltimore City, MD, were of Blacks; 87% in Fulton, GA (includes Atlanta); 85% in Prince George’s, MD; 83% in Shelby, TN (includes Memphis); and 82% in Philadelphia, PA. 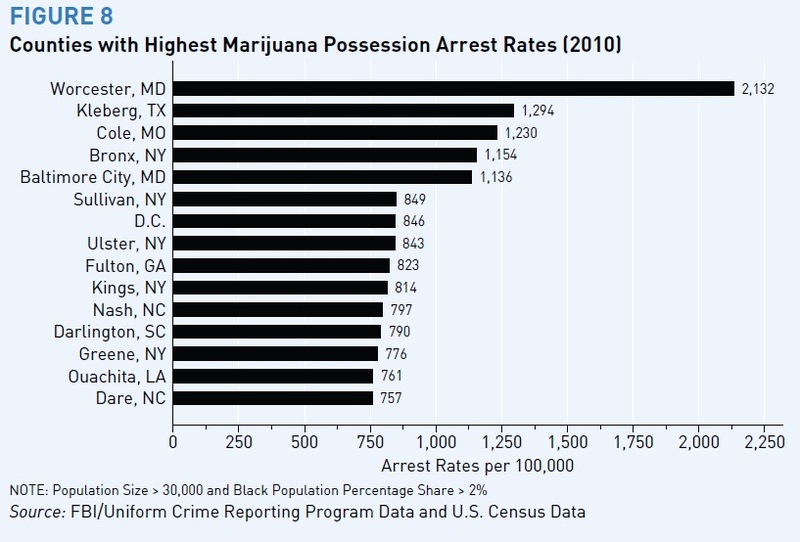 These staggering racial disparities in marijuana possession arrests exist in many counties irrespective of the overall Black population. For example, in Lycoming and Lawrence, PA, and in Kenton County, KY, Blacks make up less than 5% of the population, but are between 10 and 11 times more likely than whites to be arrested. 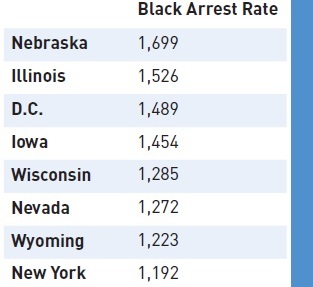 In Hennepin County, MN (includes Minneapolis), and Champaign and Jackson Counties, IL, Blacks are 12%, 13%, and 15% of the population, respectively, but are 9 times more likely to be arrested than whites. In Brooklyn, NY, and St. Louis City, MO, Blacks comprise 37% and 50% of the residents, respectively, and are 12 and 18 times more likely to be arrested than whites. In Chambers, AL, and St. Landry, LA, Blacks account for more than twice as many marijuana arrests (90% and 89%, respectively) than they do of the overall population (39% and 42%, respectively). In Morgan and Pike Counties, AL, Blacks make up just over 12% and 37% of the population, respectively, but account for 100% of the marijuana possession arrests. 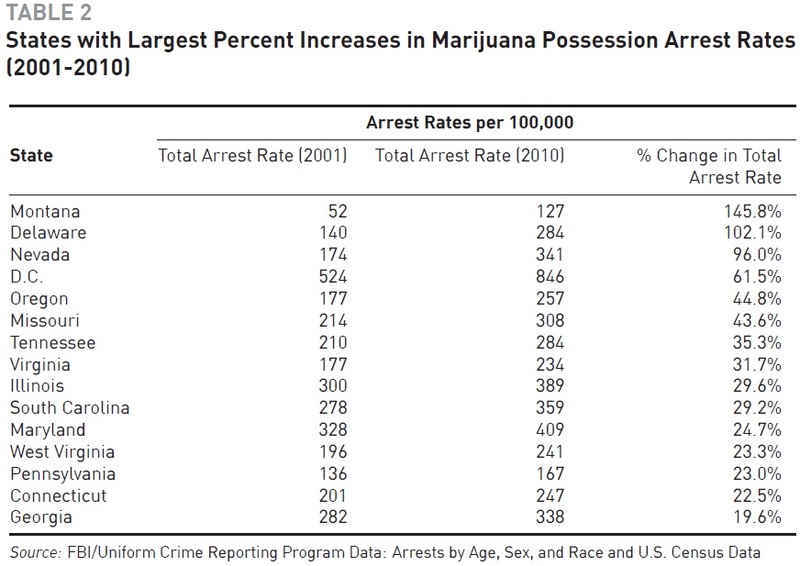 In nearly half of all states, over 90% of marijuana arrests were for possession. 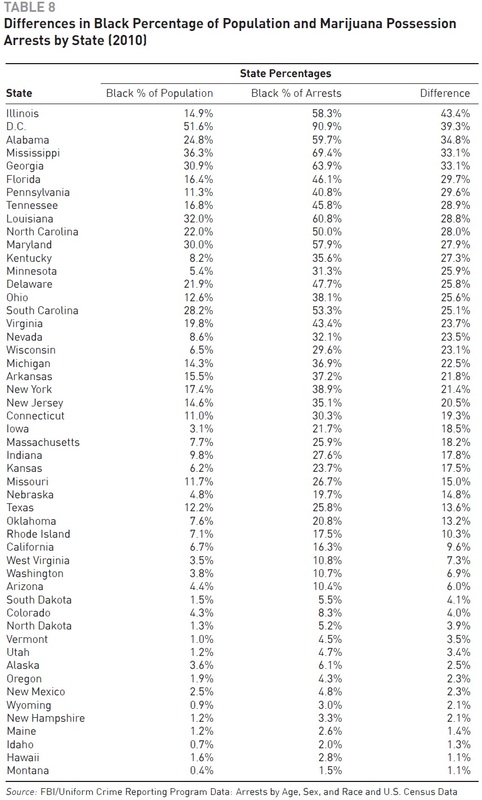 In only 7 states did possession arrests account for less than 80% of all marijuana arrests, and in only 2 — Massachusetts and Minnesota — was the figure below 65%.